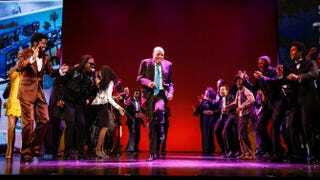 Berry Gordy dances onstage with the cast of Motown the Musical at the Pantages Theatre on April 30, 2015, in Hollywood, Calif. Stories. Berry Gordy has them. Stories of Diana Ross, whom he once romanced, leaving Motown for $20 million. Stories of Stevie Wonder’s mother’s list of demands before she would allow her child to sign with the label, which included a washer and dryer. Stories of Rick James smoking ”Mary Jane” in the studio. And stories of Mickey Stevenson, Motown’s A&R executive taking … well, we’ll let Gordy tell it. Much of Motown’s roster was “too important” when they got out of line. So Gordy had to get creative in his punishments by targeting their payroll. A person could listen to Berry Gordy for hours. He likes recounting his life and the people he has worked with and loved. Stories of Michael Jackson, who was like a son; of Smokey Robinson (“He was so proud to be at Motown”), who is Gordy’s best friend and “was the soul of Motown.” Unfortunately, not everyone can get hours with Berry Gordy. The Root had to settle for 10 minutes. Everyone else will have to settle for maybe a seat at the National Theatre in Washington, D.C., where the musical based on his life, Motown the Musical, is currently running for five scant weeks. Gordy, a living legend, was in Washington, D.C., on Wednesday, Dec. 2, for the musical’s opening. It was written by Gordy and is based on his autobiography, To Be Loved. It’s a whirlwind of Berry’s experiences as Motown’s creator and head executive, set to a jam-packed soundtrack of the legendary record label’s most monstrous hits. Fifty-nine songs are featured in total, from early Gordy-written hits “To Be Loved” and “Reet Petite” to classics like the Robinson-penned “My Girl” and “Shop Around.” They’re all featured around a storyline that follows Gordy from childhood to his romance with Ross to 1983’s Motown 25 concert, where acts like Jackson (both solo and reunited with the Jackson 5), the Temptations, Ross, the Four Tops and others returned to put on a show in honor of the label many had left behind for greener (and less restrictive) pastures. Berry was notoriously controlling of the images of his Motown acts. He wanted them to have the right look, the right appeal, the right sound. When asked about modern acts and if they could have passed Motown’s rigorous standards, Berry—ever diplomatic—moves away from naming names. Still, Gordy likes a lot of modern music. “I pay attention to all music. I love all music, from classical to jazz to rock to rap to R&B to hip-hop. I mean, I love music, period; it’s just that it needs to be good!” Gordy said. The relationship with the artist was paramount for Gordy. At Motown, there was a lot of love there, but there also had to be respect. It’s hard to find words that easily sum up the expansive musical and historical work of Gordy, the music mogul, but Charles Randolph-Wright, who is Motown the Musical’s director, has a suggestion. “My goddaughter, when I was talking to her about Berry Gordy, she said, ‘I know his name, I know Motown [and] all that stuff, but explain to me who he is.’ And I went, ‘Steve Jobs.’ And she went, ‘Oh.’ He single-handedly changed the world. And that's who he is,” Randolph-Wright said. Gordy the man, though, is humble, if not bemused by the suggestion. Motown, after all, was a game changer.